'A Great Tree' – produced by arts initiative South of the City and created by Melbourne musician Finnian Langham – is a multi-sensory installation combining original music, light and space to convey a narrative around the mythical tree Yggdrasil, which is said to house the networks between worlds in Norse mythology. We got chatting with the brains behind it to get an inside scoop before it all happens tomorrow night. South of the City’s upcoming event is the first of many to be hosted by Céramiques Elsternwick – a relatively new studio based in Melbourne’s south, run by Guy Vadas. Vadas' venue is to be host to several exciting events such as markets, performances, and poetry readings to list a few, as he continues his close work with South of the City (SOC). SOC is run by a collective of young creatives who have been working tirelessly to promote local music, art and film in the South of Inner-Melbourne. In a recent media release, SOC tell us that they focus heavily on "connecting artists of any stripe with audiences in local venues that are too often left undiscovered." South of the City’s work to bring passionate artists and enthusiastic audiences together is something we love to see at Trouble Juice, and we look forward to seeing what else they have planned. 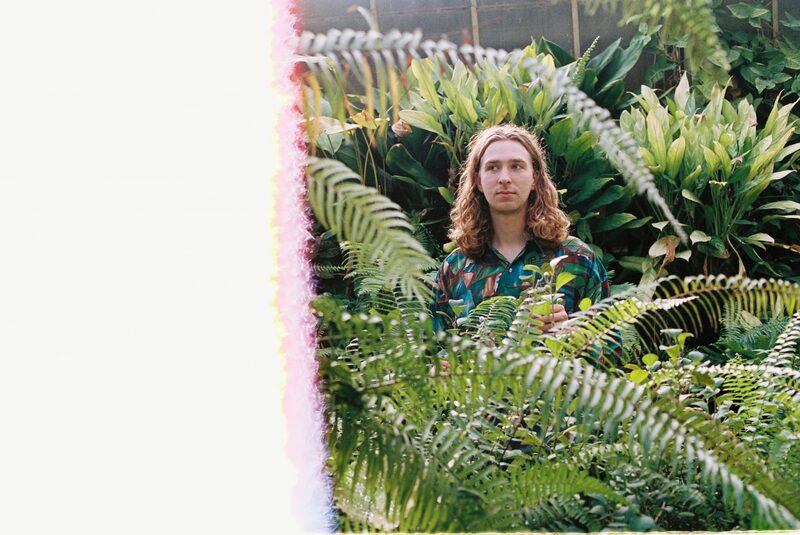 'A Great Tree' is the coming to life of a specially composed multi-sensory experience by Melbourne musician Finnian Langham, who may be known for his recent debut house EP under alias Saltfork and his brand new project Tony Chocoloney. Langham’s instillation embodies his effort to explore the visualisation of sound, paired with the imagined realities within the sonic landscape of his electronically produced music. Langham uses his work to display a relationship between music and visual art, and the influence the two mediums can have on each other, to its audience. 'A Great Tree' is the result of Langham’s passion for both exploring sensory relationships in art and his enthusiasm for Norse mythology, which he ties together neatly in his 30-minute experience. Saturday’s event has us excited for so many reasons - we had to know more - so we got in touch with Finnian and Theo Carroll from South of the City to get a glimpse into what we should be expecting. TJ: 'A Great Tree' is a pretty different from anything else we’ve covered so far on Trouble Juice. What inspired the concept? Finnian: Last year I was really interested in the relationship between sound and vision - how these senses enhance and inform one another, and what kind of meaning is created in our minds when there is a perceived connection between relatively abstract sensory input. Previously, I'd worked with a digital artist to create animated visuals which reacted with music I'd written, but ultimately I didn't find the result particularly affecting. I felt that by confining these images within a screen, there was an emotional disconnect for the viewer, and so I wanted to create something tangible and grounded in reality, to bring this concept of reactive visuals into a physical environment. What can we expect from the evening? Theo: Walking into the studio from the street will be pretty spectacular - this huge sculpture will be centred in the room, casting waves of coloured light over every surface. The illuminations swell and disperse along with the music, reacting uniquely to each new phrase of the three-part electronic composition. Audiences are invited to get up close to the sculpture and interact with it from all angles, inspecting the undulations of light and music from different points in the space. Alternatively, bring a cushion and have a sit on the floor. A Great Tree can be many things depending on what you want from your Saturday night - meditative, experiential and trancelike, or active, dynamic and intense. Finnian, how have you chosen to interpret ancient Norse mythology in 'A Great Tree' and why those stories in particular? Finnian: I studied the Norse myths in primary school and since then have always loved those stories and those worlds. While trying to devise a project for the final semester of my undergrad last year, I had this weird Eureka moment at my desk where the entire concept for this work suddenly materialised in my head. I must have recently been talking about Yggdrasil and Norse myths with some friends, and just had it on the brain. The Norse mythological cosmos has nine distinct worlds, and these worlds are connected by a great tree called Yggdrasil. My idea initially was to write a suite of nine pieces, one for each of the worlds, and have them linked thematically by a sculpture representative of Yggdrasil which would be fitted with programmed lights to visualise the music, and further convey the feeling of these different worlds. The final work is extremely close to that vision which is something I'm really pleased about, however due to time constraints of the project I decided to make it just three movements so there would be time to flesh out each one sufficiently. The three movements are, respectively: Nilfheim, world of ice; Midgard, home of the humans; and Asgard, home of the Gods. In each movement, the lighting design mirrors the atmosphere of these different worlds, and adds to the feeling of an overarching arc or narrative which the whole work follows. We begin in this frigid world of ice which is quite sparse, ethereal and crystalline, then move to the world of the humans which has more of a solid body to it, and finally we ascend to the plane of the Gods. I wanted the whole thing to feel like a journey, to transport the audience to a world outside of our own. Did you collaborate with any visual artists to produce 'A Great Tree'? Finn: Yes! One of the great joys of this project was working with some incredible people without whom this would not have been possible. Firstly, sculptor Yuval Rosinger designed and built the wooden structure itself, and then lighting designers Rachel Lee and Nick Moloney installed all the LED lights onto the structure and did all the technical trickery to allow me to sequence all the lighting through Ableton Live. It was a nice experience having this idea that I knew I couldn't do by myself, and working with these amazing artists to create this was a really exciting and rewarding process. SOC have been throwing events in some great south side venues for a little while now. Tell us about Céramiques Elsternwick. Theo: Céramiques Elsternwick is an amazing space that's just opened up around the corner from Elsternwick station. By day, it operates as a ceramics studio where people can learn the art of ceramics from scratch or hone their skills if they've got a bit more experience. It's owned and operated by the lovely Guy Vadas, surely one of the only 21-year-old studio owners going around at the moment. He's curated the space beautifully with plants hanging off every surface and these pottery wheels that have the vibe of Italian scooters. Guy has been on board with SOC since he came down to one of our first exhibitions last year, and when he told me he'd been thinking about opening up the studio for exhibitions, gigs and markets, a collaboration was the natural progression. Tell us a little about your other projects, Finnian. Is this your first experimentation pairing visuals with sound? Finn: This is the first thing I've made that I feel comfortable displaying in this arty context and taking seriously. My previous composition work has mostly been scoring short films and video games, as well as some commercial ad work, so it was nice making something with a clear concept which exists just for the sake of itself. Last year, I got really excited about dance music, and while that influence is definitely felt in 'A Great Tree', it was never written as music to dance to. However, exploring my interest in house music last year led to the release of my first EP and some remixes under the alias Saltfork, which was a big step for me. Right now, Saltfork is on ice as I've got a new project, Tony Chocoloney, through which I'm trying to conjure up some trippy, off kilter disco. So far I've released one track as part of HomeTurf's second VA compilation which is out on Bandcamp, but there's heaps of stuff cooking right now at Chocoloney HQ, so hopefully it won't be long before some more of it can see the light of day! Anything else in the works for South Of The City? Theo: There are plenty of new events we're about to activate as we head into winter. With Céramiques Elsternwick, we're going to host Little Makers Market on the first Sunday of every month (starting in June). The markets will feature a limited number of young artists, designers and craftspeople, and the roster of stallholders will change each month. Still under wraps is two new series of weekly events scheduled to start in July. They'll take place in a brand new performance space in Elsternwick with a focus on progressive sounds, diversity and new atmospheres. One night will be made up of music and visual art, and the other alternating between poetry readings and new-comedy. On 7th July, we're putting on an intimate event with Hemm, Ariela Jacobs, Kill the Darling and Mel Taylor called Lyricism. The artists will strip back the layers of melody and instrumentation present in their normal performances, instead foregrounding their lyrics. This intensely bare focus on poetics will be paired with projections displaying the lyrics of each song live, as they are sung. 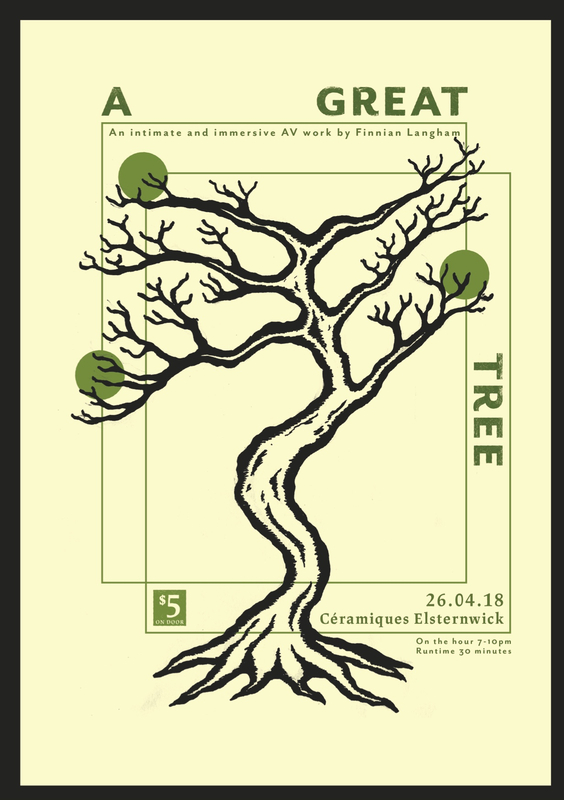 'A Great Tree' takes place tomorrow night from 7:10pm at Céramiques Elsternwick.